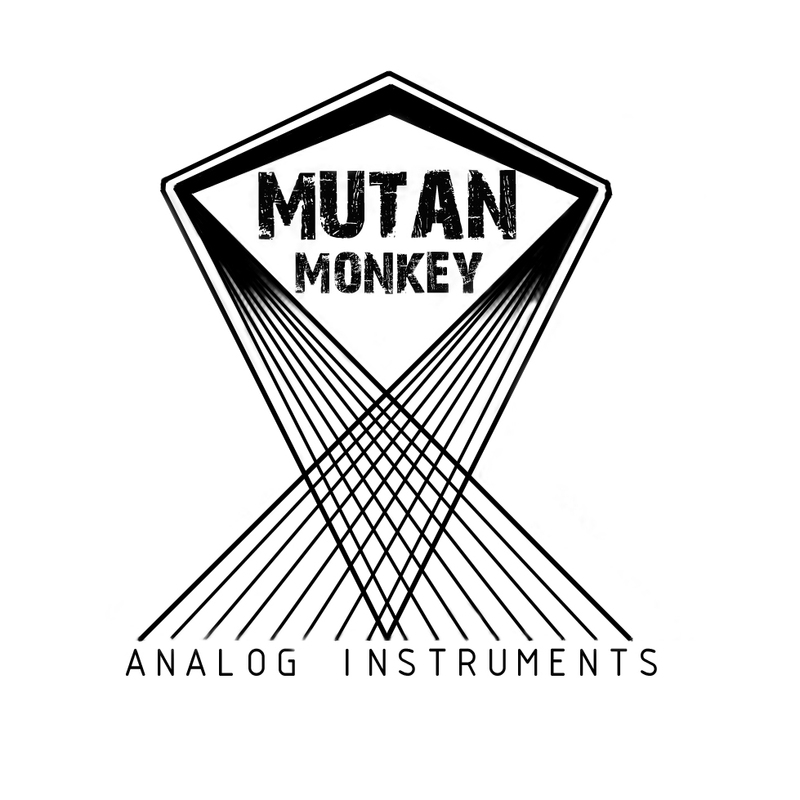 The Gjengangar (a name which I am not going to even attempt to pronounce) is a handmade effects pedal from a tiny boutique manufacturer in Bergen, Norway. Their name is Pladask Elektrisk. Ever since I stumbled upon Pladask Elektrisk’s creations, I’ve been keen to get my hands on one to try out, and after battling the evils of customs and import tax, the day finally came. 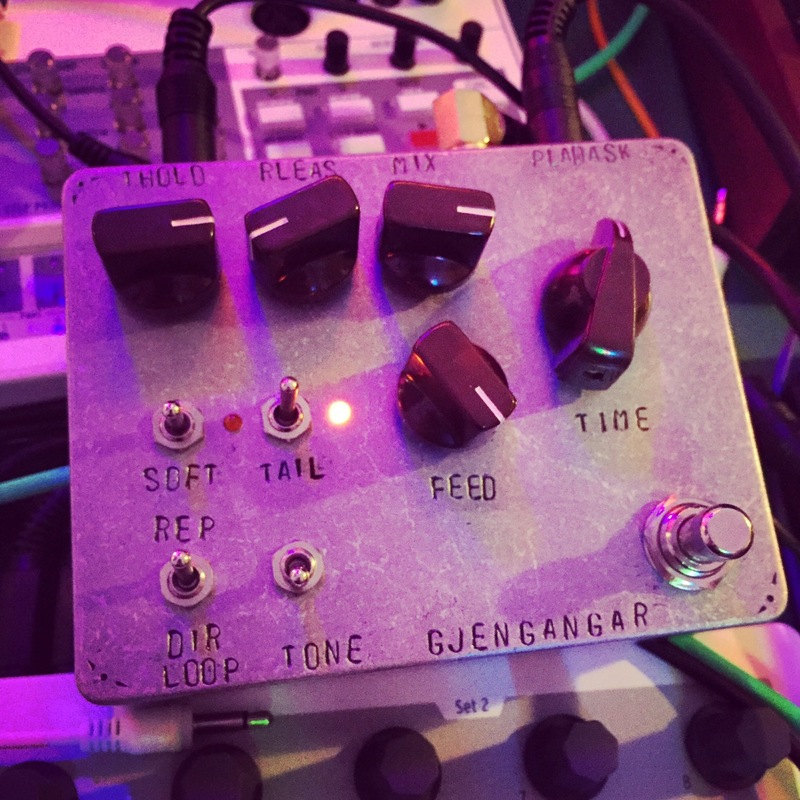 Here, we’re going to look at version 2 of the Gjengangar: an experimental, gated delay pedal with built in effects loop. 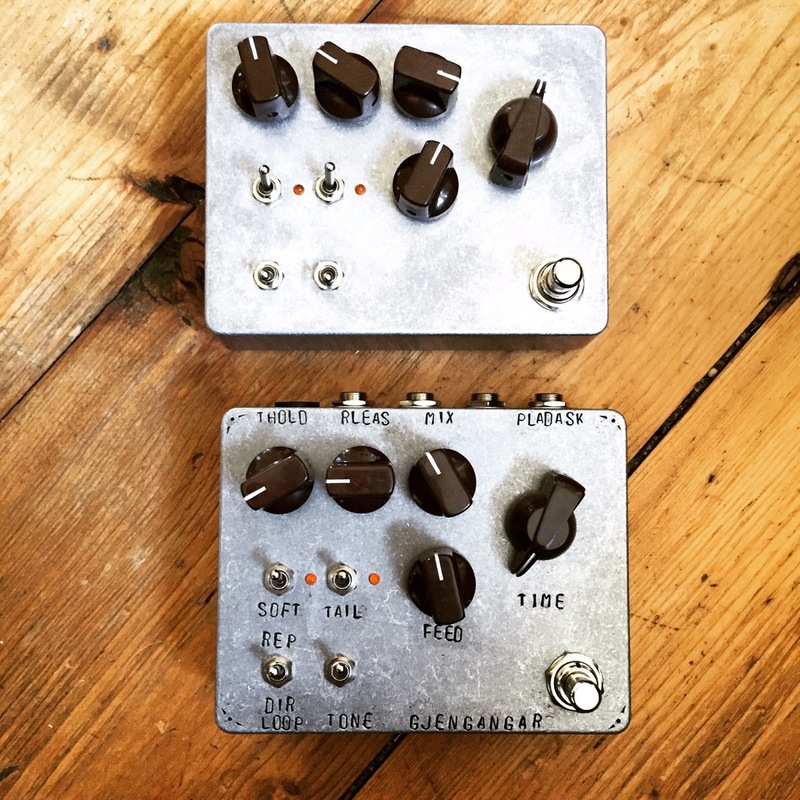 All of Pladask Elektrisk’s pedals have a beautifully rough, industrial style, with the raw, brushed aluminium sitting nicely against the soft orange lights on the Gjengangar. It conjures up images of sitting by a campfire in the snow Nordic wilderness… with even the indicator text etched out in a way that’s reminiscent of bird scratches. That could sound like an insult, but it’s not. I really love having the Gjengangar with its grungier edge in amongst the more ‘polished’ pedals on my board. Prototype up top. Production unit down below. Feels wise, aside from the general design, there are a couple of small details that make the Gjengangar an extra pleasure to use. The function toggle switches are extra low profile, which means you don’t worry as much about snapping them off accidentally as you might with the standard kind (What… you mean you don’t worry about that?!). In addition, the main footswitch is of the soft release kind – with both momentary and latch-style actions. Pretty clever, and particularly pleasurable to operate. 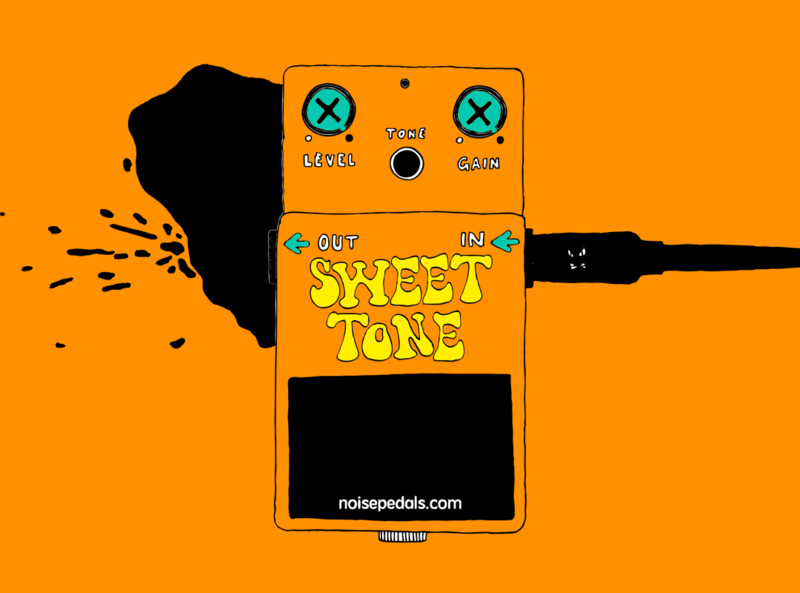 The pedal isn’t purple. It’s my mood lighting. 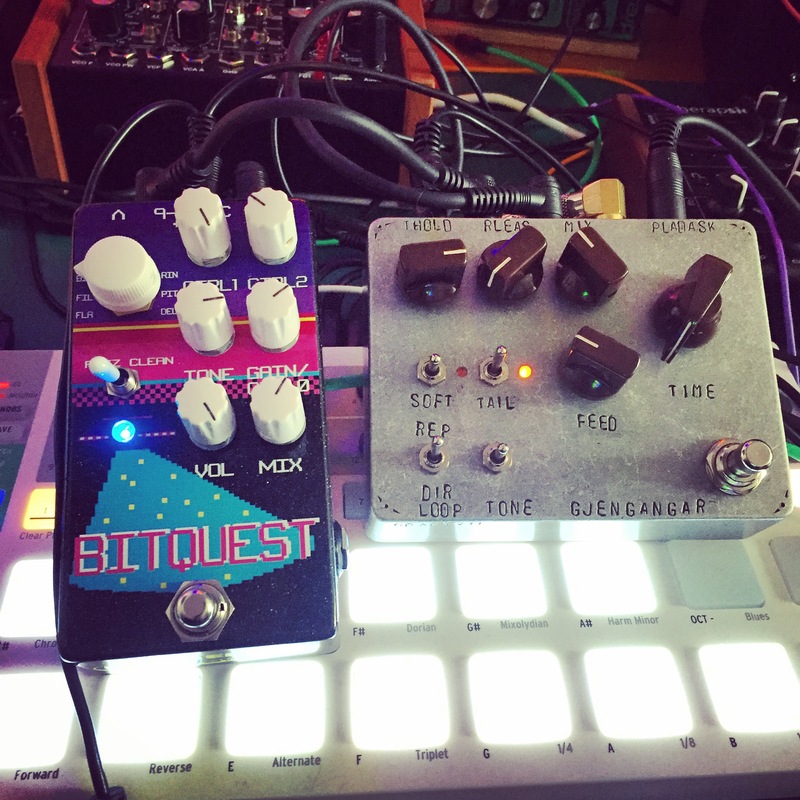 Despite being built on the popular PT2399 chip (making use of two for a reportedly higher quality sound), this isn’t your run-of-the-mill delay pedal. The Gjengangar boasts a variety of different features to set it apart. 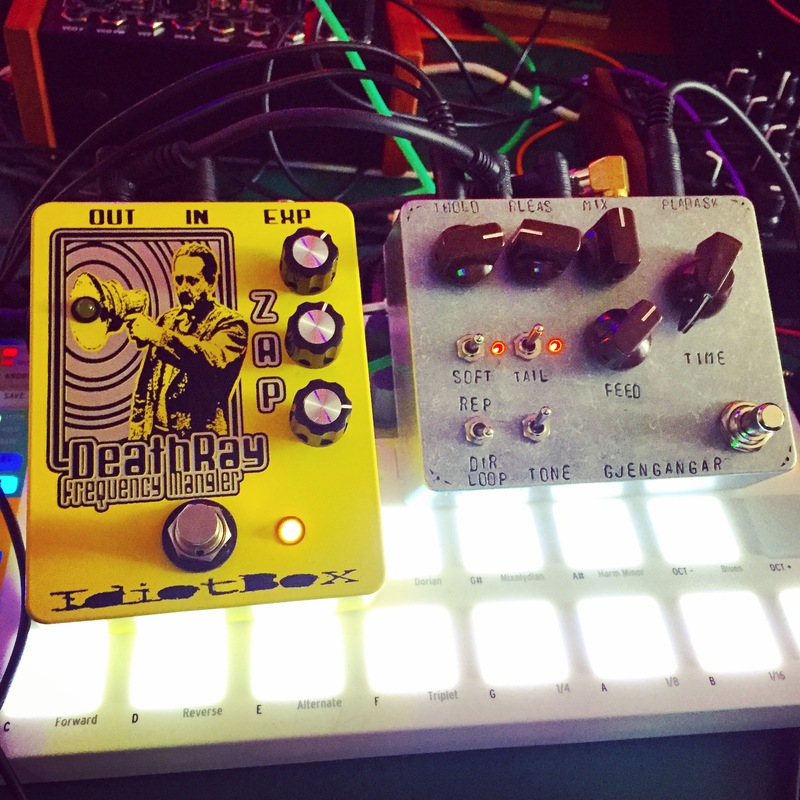 Gated Delay: Everybody loves a good delay sound, but having it on all the time gets old reaaaal fast. Sure, you could manually turn it on and off, but that isn’t really a practical solution for full tracks. Having a delay that automatically switches on at certain points to add that little bit of character to your sound without overdoing it is the dream, and is exactly what the Gjengangar excels at. Tone: Changes the tone of the repeats from dark to bright. Feed: The number of repeats, from 1 to insanity. Mix: Controls the level of the effect, or the wet/dryness of the signal when the effects loop is engaged and set to DIR Mode (in other words – how much of the loop comes through). Thold: Controls at what level the input volume must be at before the delay will engage. This can momentarily be bypassed by holding down the footswitch to immediately open the gate. Rleas: How long the gate remains open after the input volume drops below the threshold required to activate. Soft: How abrupt the gate opens and closes. There are three options: fast, medium, and slow, which lets you control whether the effect cuts off sharply, or feathers off gently. Loop DIR/REP: Controls the effects send/return loop. DIR mode applies the looped effects to both the repeats and the signal, whereas REP applies the effects solely to the repeats. Tail: Selects either a buffered or ‘relay based’ true bypass – the former of which allows a delay tail. In DIR mode, the buffered bypass also allows the effect loop to remain active. The Gjengangar costs 255USD, and can be purchased direct from Pladask Elektrisk here.